Well! what a summer that was for vegetables! 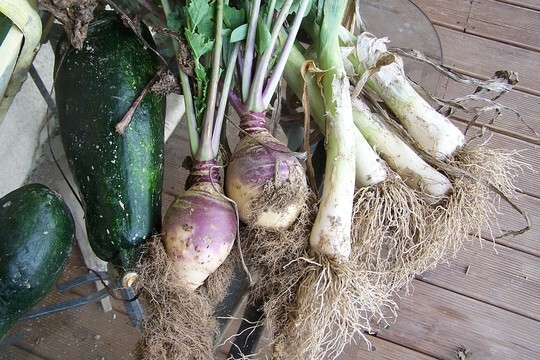 All over bar the shouting except for the winter veg….swede, parsnips, leeks. 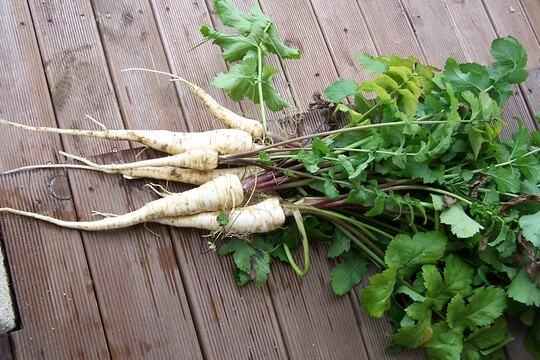 I know I shouldn’t dig parsnips until after a frost but…….. 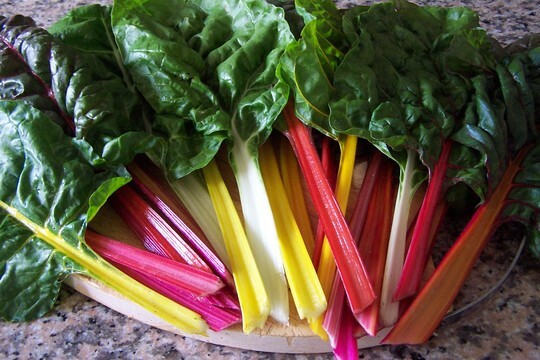 The rainbow chard is still going on marvellously and it works just like spinach without the growing hassle….and its pretty. Can’t shout to the roof tops loud enough about Moonlight runner beans. They have been incredible. I am letting the last of them dry on the strings for next years planting. I am doing the same with the last of the french beans as well. Supposedly, they get even better as they get to know and adapt to your individual conditions if you do this……probably an old wives tale but worth trying (I am an old wife). Lots of pots of Spicy Tomato Chutney in the store cupboard and Italian Tomato sauce in the freezer. Also some really nice Runner Bean Chutney that is a bit like a mild Piccalilli…….had to do something with my bumper crop. Also trying this year with pickled Nastursium seeds, which are meant to be “mock” capers. Give it a go! 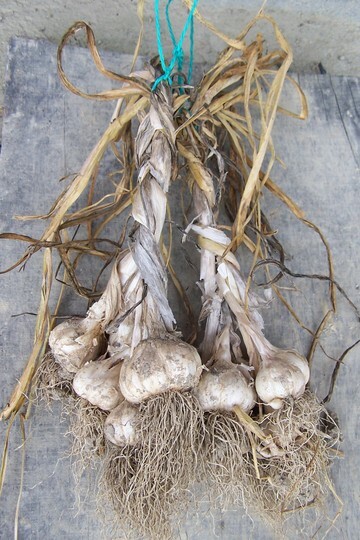 In spite of a little man in a white van coming round the village twice a year beeping his horn selling garlic, this year I decided to grow it for the first time. I tried the pink Auvergne variety and it is really sweet and nice. Sometimes garlic can be very strong and bitter. So I am pleased I gave it a go. 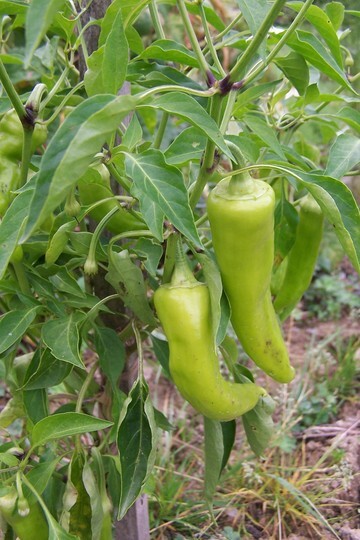 My hot chillies have taken on a second wind and I have about 12 on the one plant. Early in the summer I had just two! Chili con Carne anyone? And the flower garden is crazy. 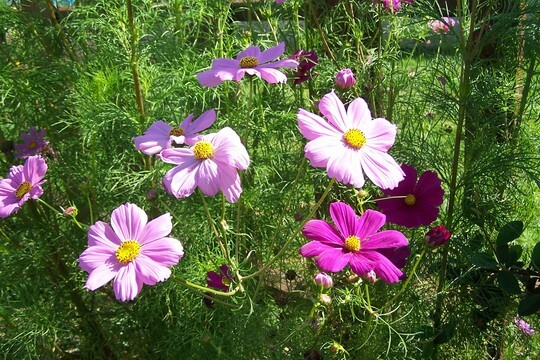 I spent most of June and July convinced that none of my seeds had taken and bemoaning the waste of money etc etc….Then suddenly in August and September I have a garden full of Cosmos, Larkspur, Stocks, and the Morning Glory…actually trying to get in the back door! Fortunately, we get two summers here, one for the visitors and then September and October when they leave and the flowers go on and on and it is even drier and almost as warm. The Michelmas Daisies are gorgeous and I am waiting with baited breath for the yellow Chrysanthanums which promise to be even more of a picture this year. The Jerusalem Artichokes have just come out, they are a very useful cutting flower. 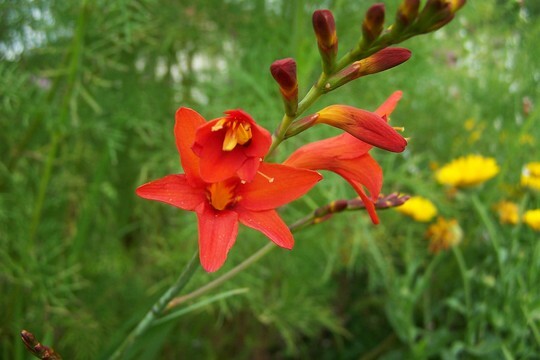 Also have a few shrubs that are having a second flowering Clemetis, Kerria and Honeysuckle. My poor Iceberg Climbing Rose that lost everyone of its leaves has got them all back and is in bud again. So all in all a very nice season and it is still about 30C and sunny on the terrace. Another perfect year in paradise then LOL ………..:-D Better to be happy than rich………..Oh all right! I think that's called A Good Harvest! It all looks brilliant. Troddles , everything just lovely for you . A cornucopia . Flowers have been all out of kilter this year here but the morning glory have excelled , mine have been mostly red , the blue ones have reddish stripes and are not so strong . I just love those blue ones of yours . 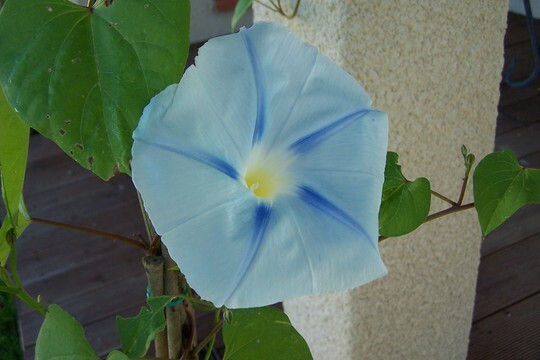 The Morning Glory are from the seeds Unwins "Blues Band", Driad. They come out a different colour blue each morning. It's quite exciting! There's something very satisfying about decideing the veg for dinner and going out and digging it up or picking it Joan, isn't there? 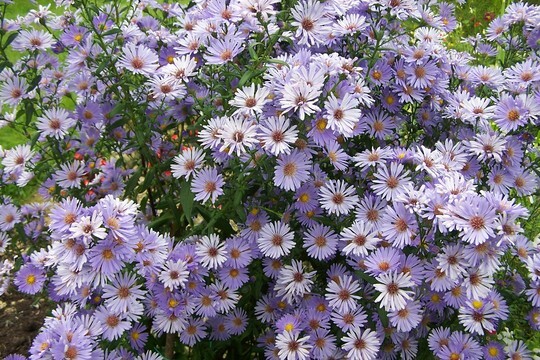 Also ... is that a Michaelmas Daisy in the fourth flower photo down? It's beautiful! 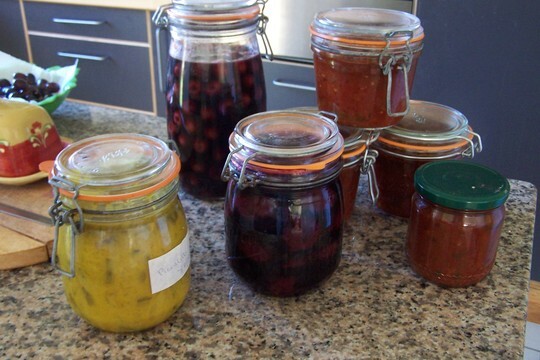 Can we have the recipe for the Runner Bean pickle please Troddles ? 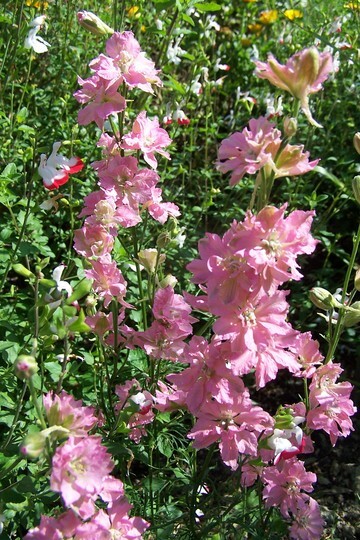 Dwyllis, it is a Larkspur, the seeds are Unwin's Choice Blend and it says "rare colours" they are light pink, dark pink, violet, grey, all sorts. The Michelmas Daisy I grew just this year from a tiny root taken from a friends garden, it is gorgeous and the bees think so too! Hard work isn't it Nariz! Can't wait to light the logburner and retire to the sofa! I can never decide whether I prefer growing veg or flowers. Luckily I don't have to choose. You are right thought we don't post too many veg pictures and we should. I've grown larkspur for the first time this year and they have been brilliant. I keep cutting off hte seed heads and they keep flowering. Don't forget your seed catalogue when you retire to the sofa! This is my first year for Larkspur Marshmallow, I hadn't thought about the seed heads, thanks for the tip. I get all my seeds on my visit to England every Autumn although I know I could get them mail order, I spend a fortune and drooling in garden centres. I'm not very lucky with veg , the only leeks that I ever tried I bought as young plants like spring onions , they stayed in the ground for 18 mths and came out looking just the same ! I have my successes and failures but just keep trying. I'd just got the hang of leeks when we were invaded by leek moth. Now I keep them covered and they would never win prizes but they are ok. Tomatoes are my favourite crop to grow. Then probably mangetout. Nooooooooooo, Troddles! Not yet! Stop this talk of fires and sofas! There's more Summer out there! 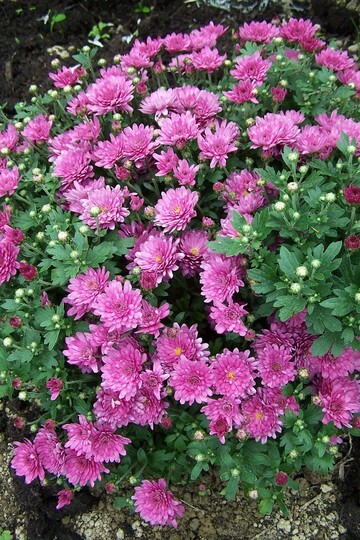 You've had some nice crops this year haven't you :o) And your flowers are very colourful. Lovely crop of vegetables and pretty flowers ... we had fresh potatoes/runner beans/carrots from our allotment with our meal this evening ... wonderful flavour! . . . . .
Have a look at the blogs posted by Balcony . . . .